Deputy Speaker Lindsay Hoyle said this week he had "never felt this level of tension"
It was at Baker Street station that I knew something was wrong. I felt a wave of nausea and began sweating profusely. I was about to pass out. A concerned passenger kindly gave up their seat. I don’t know for certain what happened on my morning commute, but one theory doing the rounds was that I was tired and a bit stressed. Not that I felt under any undue pressure; but like many others who work in Westminster, there is no doubt I had felt fatigued by recent events. The brief and minor episode got me thinking, just what impact is the Brexit debate having on our elected politicians? Amid myriad pressures – both internal and external to Parliament – how are MPs dealing with the copious amounts of stress that must, surely, be weighing heavily upon them? It turns out I am not alone. During the votes on extending Article 50, Pat McFadden, MP for Wolverhampton South East, was rumoured to have fallen ill. It was the third highly consequential evening on Brexit, after the second meaningful vote and divisions on no deal. One Labour MP tells me it was the worst week in parliament since the death of Jo Cox in June 2016. McFadden, himself a former Europe minister, doesn’t want what took place that Thursday evening to be overhyped. “Honestly, I was a little dizzy. I just needed a glass of water. It was nothing,” he explains. The Labour MP’s stoicism aside, politicians of all parties have been feeling the heat. Nigel Dodds, the deputy leader of the DUP, told me in an interview last week that MPs were finding the Brexit debate “mentally and emotionally draining”. “These are very big decisions. For all the criticisms of MPs, these decisions are weighing on them very heavily,” he said. Ben Bradley, the Conservative MP for Mansfield, says that Brexiteers have ended up in therapy and on medication for stress. 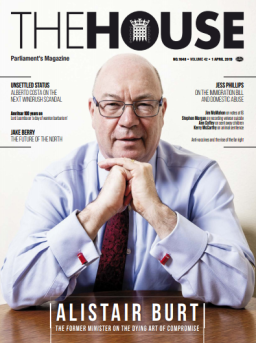 “For a lot of us, particularly those of us that are in very marginal seats, this decision and period decides both the long-term of the country and decides whether I have any hope in hell of still having a job at the end of it,” he says as we sit down for a coffee in Portcullis House. There is, of course, a personal element to it as well. The 29-year-old has a young family to care for. “It’s one of those where if we don’t do this, I absolutely guarantee you there’s no point in me delivering a leaflet at the next election. That’s me done. That’s high stakes on a national and a personal level,” he says. Bradley, who came into politics wanting to speak out on education, says there is support in Parliament for people in need. “I’m lucky enough that I’ve got a group of colleagues to be able to sit and rant with. Not everybody does. There is a counselling service and stuff like that which I know quite a few colleagues use. I haven’t done that yet, but it’s been recommended to me. So, there are avenues and support,” he says. A total of 85 MPs sought assistance through the parliamentary Health and Wellbeing Service in 2018, up from 64 the previous year, according to data obtained from a freedom of information request lodged by PoliticsHome. The top five reasons MPs sought support were skin disorders, ear, nose and throat problems, musculoskeletal issues, blood pressure and respiratory disorders. Under pressure are Labour MPs from leave-voting constituencies. While sometimes Remainers at heart, they are wrestling with the desires of their constituents, the positions of their parties and their own personal views, all of which do not often overlap. Onn, whose constituency had one of the largest votes for Leave at the referendum, outlined her thought process. “It constantly makes me think about well, what is my role as an MP? Am I part of the Labour party and so I always vote with the Labour party? Am I here as a parliamentarian to represent my constituency only? If that’s the case, why am I in the party? McFadden argues the PM’s “tone on parliament” is the story of the day, not MPs’ wellbeing. “Why has the Prime Minister of the country got nothing good to say about parliamentary democracy?” he asks. Before May’s statement, Lindsay Hoyle, the deputy speaker, advised MPs to share taxis when they leave Parliament due to concerns about their safety. He also revealed that police across the country had been notified of the situation. “Personally, I have never felt this level of tension during my time in the House and I am aware that other colleagues feel the same,” Hoyle wrote to MPs. The Brexit debate has heavily strained relationships within the major political parties. Often this has played out in public. Occasionally, private conversations have been leaked to the media. Commenting on the remark, Sandbach tells me: “It’s completely unfounded, totally untrue, made without any basis whatsoever.” The backbencher has lodged a formal complaint with the Conservative party. A Conservative spokesman said: “Our complaints process is private and confidential.” Fabricant was approached for comment. Sandbach is another MP under some pressure. Leave.EU is targeting her Cheshire seat and she is a regular recipient of hate mail. “It’s another thing I have to deal with. I have to report it to the police and we have to establish how much of a threat it is. It’s not very nice,” she says. MPs might not garner a whole deal of sympathy. At the end of the day, they put themselves forward to take on public service and are well remunerated for doing so. The Brexit impasse, arguably brought about in part due to parliament’s inability to come to a collective view, is having implications well beyond Westminster. The truth is, though, that how MPs vote on Brexit will follow them around for the rest of their parliamentary careers; at various points looking ill-advised or prescient. We expect politicians to make decisions of great magnitude without complaint. But we would do well to acknowledge the challenge at hand.